Beets are an extremely healthy root vegetable, but most people either love them or hate them. Using beet root powder made from dried beet roots is a great option for people who aren't beet fans but still want the benefits. Beetroot is low on calorie and yet packed with many nutrients that help the body work efficiently, and has been proved in a number of studies to enhance athletic performance. Beetroot powder is rich in antioxidants, dietary fiber, calcium, iron, potassium, folate and manganese, along with other nutrients. Perhaps most remarkably, beets are naturally rich in nitrate, compounds that can improve blood flow and lower blood pressure, leading to noticeable health benefits. Copper in beetroot helps make the iron more available to the body. Can be creatively added to smoothies, salads, vegetables & salad dressings to name a few. Certainly we know beetroot is good for us, but it can be a bit tough to incorporate it into our diet. That’s where Pansari Beet Root Powder comes to complete your menu without any hassle. What is Pansari Beetroot Powder? We know that organic products are important to many people who focus on a healthy lifestyle. 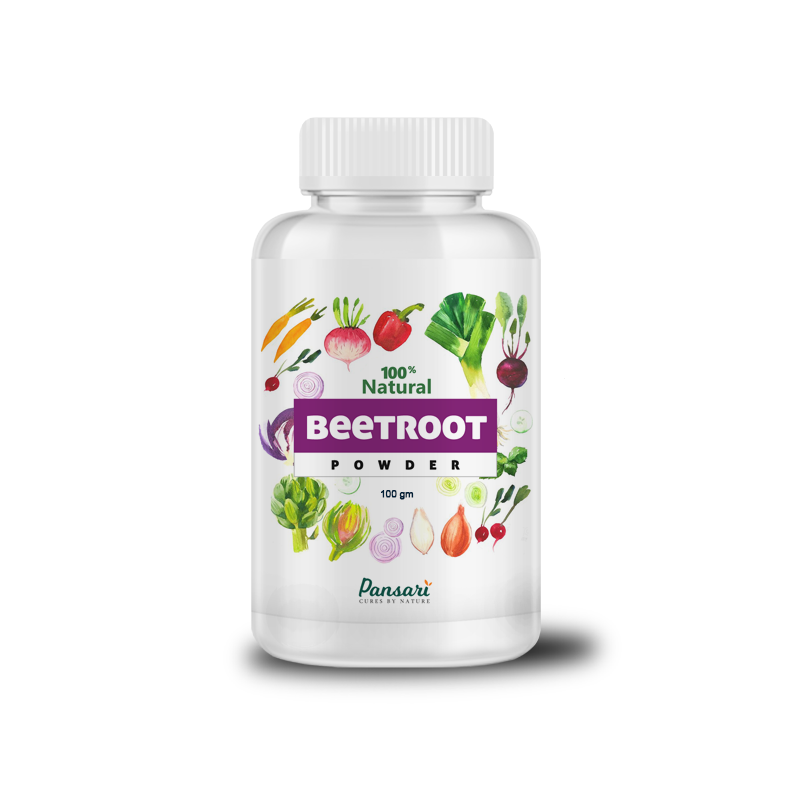 Beetroot being one of the most beneficial health product now can be consumed anytime easily, It’s Organic, 100% pure beet root in powder form. Why Use Pansari Beetroot Powder and not the Fresh Beetroot? There’s almost no prep work required. You don’t have to wash this beetroot, boil or chop it for salads etc. Pansari Beetroot Powder is prepared under strict observation and quality standards with its full potency in our stores for up to several days. We don’t add any colors, flavors, nutrients or preservatives to make this seem like real beetroot, it is real beetroot, with all original nutrients, colors and flavors intact. And above all, its way nutritious and healthy as the fresh ones. How do I use Beetroot Powder? One teaspoon of beetroot powder is equivalent to one beet. Add it to your tomato sauce for great color and extra nutrition. Mix it in your applesauce. It adds a beautiful color to this food and is a great way to sneak in some extra iron for your picky eater kids. Mix it with your pancake mix to create beetroot pancakes. Pinkish red pancakes are pretty to look at and fun to eat! Add it to your red velvet cake in place of food coloring. It will add beautiful color in a natural way. Mix one tsp to a glass of milk and drink it. Hence, there are multiple ways to your creativity of how you like to use it in your meals. 1 teaspoon with room temperature milk once a day. Does the dehydration process of the Beetroot degrade nutrient quality, too? If still there is any confusion and you feel lost about the usage of Pansari Beetroot Powder, contact us on our given mediums and one of our representative will be there to assist and guide you thoroughly. Note: Kindly note that patients suffering from thalassemia minor should not use this beetroot powder. No artificial Color, Flavor, Preservatives are added.